It’s February! And that means that Valentines Day is only a short time away. Some of you – the non singles – will most likely be going out with your significant others that day, while the rest of us find something else to do. Some people may not have even planned where they’ll be going or what they’ll be wearing for their date. I’ve come up with some destination outfits that could give you inspiration while you plan out where you’re going or to just give some inspiration on some outfit ideas. Today’s destination is the beach. Spending a day at the beach can be really fun, for me it’s a place where you can relax and have fun. For the swimsuit I chose something really cute and simple. The swimsuit is really the focal point of this outfit, it has the most colour and really catches the eye, without being too much. This comes from Topshop. I threw in a little coverage for a day at the beach with a cover-up. I really like this one that goes to about mid-thigh with all it lace and fringe-y goodness from John Lewis. Overall I wanted to keep this look pretty simple, but I also wanted every piece to have a voice and these shoes just mellowed right in with everything -in terms of matching – while of course still standing out a bit by bringing in some gold to the mix. These shoes are just so cute and practical for the beach. These shoes are from Sperry Top-Sider. Of course if you’re planning to spend a day at the beach you’ll need a bag to cart everything around in. This bag has a lot of space just for that purpose while still managing to look chic. This bag comes from Saks Fifth Avenue. Lastly were at accessories. Since it was basically a day out at the beach I chose something where you could go into the water without worrying about having to take off all your accessories before going in. This is a handmade Mustique bracelet from JIYA. And so there you have it my Valentines beach outfit. If you’re interested in any of the clothing items mentioned above you can check them out using the links below. *P.S – Don’t mind the chair, I was just trying to add to the beach theme. Some of you have probably already heard of blogger challenges and they usually only last a couple weeks. 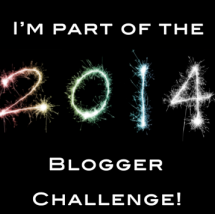 Well the 2014 Blogger Challenge is a bit different. It lasts a whole year! For the upcoming year of 2014, literally hundreds of bloggers of fashion, beauty, lifestyle, mom life etc. will be participating in this. We’ll be posting in the 1st and 3rd weeks of every month from the prompts that will be e-mailed to us. Are you a blogger interested in this challenge? Then all you have to do is e-mail Gaby from the blog Another Girly Blog at: (anothergirlyblg@gmail.com) with you your name, e-mail address and you blog URL. You have to act fast though, sign up ends on the 9th of December. You can get more information about the challenge here. I hope that as many of you as possible will participate in this challenge. 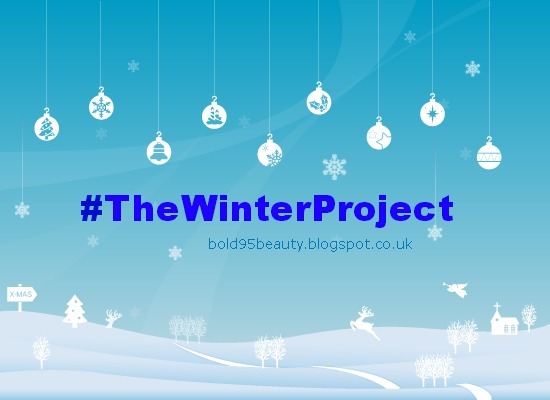 Hey everyone, it’s now week 3 of #TheWinterProject and that means it’s time for my favourite winter scents. The smells of citrus and tea really get me in the winter mood and I know that if you read my October Favourites post here, you’d remember how I was (kinda) obsessing over the smell of this St. Ives Exfoliating Scrub. It’s a green tea scrub that smells vividly of tea with a hint of citrus to it and if I could smell it all day then I probably would . . . but then I’d probably get a headache. 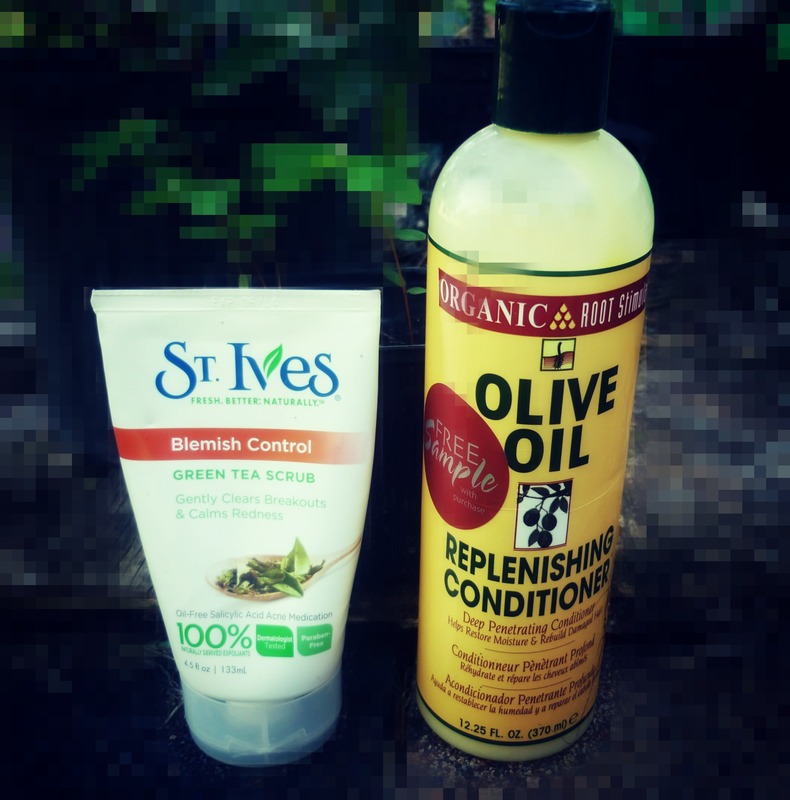 Finally, the replenishing conditioner from my last haul post,here. This conditioner has a fresh citrus scent to it and I just love smelling it when I use it. And these are my favourites scents that remind me of winter. What scents remind you of winter? Bye, I’ll talk to you all in the next post. This is my first ‘Haul’ post you guys! It’s been a while since I’ve been shopping, I haven’t told you guys this yet but I’m actually in my last year of high school and the pressure is on, but it was about time that I restocked my hair products and so on Saturday I went shopping and got a little extra along the way. I just bought some of the products that I usually get for my hair as ‘Organic Root Stimulator’ is one of my favourite hair brands. 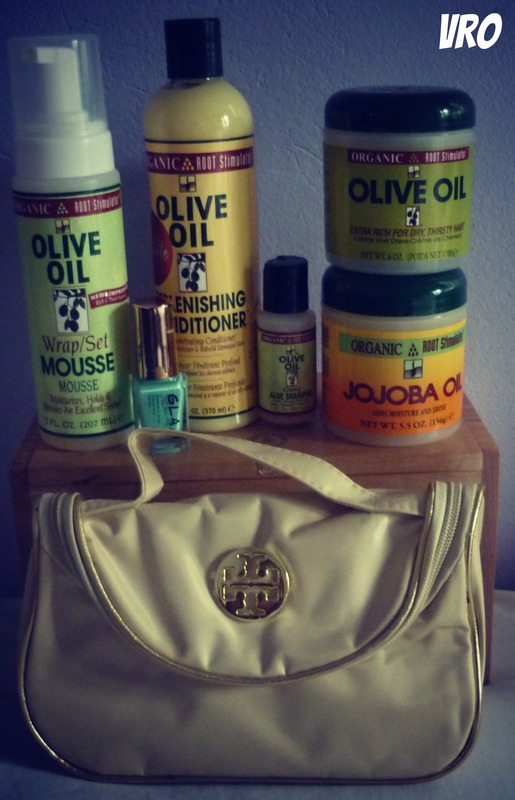 The products really help with my dry hair and breakage. I got a mousse, jojoba oil scalp moisturiser, a hair moisturiser and a conditioner that came with a shampoo sample. I also got a nail polish from ‘GLAM’. When I saw the colour I couldn’t resist. The colour is actually very similar to one that I had in my ‘Winter Nails’ post from a few days ago and I’m not going to lie, as soon as I got home I just had to put it on! It has a good formula though it could’ve been better. If you put on multiple coats at a time without giving each coat time to dry completely, you’re gonna have hell in getting it to dry after making that mistake. Last is the makeup bag, I’ve been meaning to get a new one for a while now. The on I had before was one of those flat ones and it was a bit too small for what I wanted to put in it. This one though is not too big, but it has plenty of space and it even has slots inside to hold makeup brushes. I’d prefer it if it didn’t have the handle at the top but oh well. Bye you guys, talk to you in the next post.